This dramatic change has forced local officials and nonprofits to think differently about affordable housing. Last week, NPQ profiled a nonprofit that collaborated with the building’s owner to convert an abandoned shopping mall into homes for the homeless. In a similar way, churches have become part of Alexandria’s affordable housing strategy. Helen McIlvaine is Alexandria’s director of housing. She sees many possibilities. “I go past a Scottish Rite [Masonic] temple and say, ‘Do they really need all that land?’ Once you start looking, you can’t stop—there are opportunities everywhere,” McIlvaine explains. 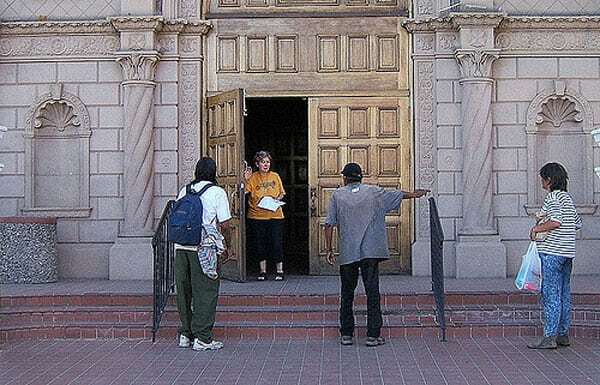 Most houses of worship follow the same script, selling their land outright to a nonprofit developer or signing on to a ground lease, which allows the developer to build and operate the affordable-housing units while the church retains ownership of the land. The units built are usually designated for people who make 40 to 60 percent of the area’s median income. The construction fee is driven down by low-income-housing tax credits, which the government grants to affordable-housing investments. Still, each unit can cost hundreds of thousands of dollars to build. This means churches and their nonprofit developer partners often face a “gap” in the financing, as McIlvaine calls it—and that’s where the city steps in. In each of the church projects McIlvaine has undertaken, the city of Alexandria contributed a long-term loan often amounting to several million dollars. McIlvaine said the Office of Housing typically receives a yearly budget of between $4 million and $6 million that it can dedicate to affordable-housing initiatives. For instance, David Bowers, vice president of the national nonprofit Enterprise Community Partners, says Enterprise has helped seven houses of worship in the Baltimore-Washington region engage in similar arrangements to those in Arlington, VA. According to Bowers, the Mid-Atlantic region has become a national leader in church-based housing partnerships. Enterprise formed its Faith-Based Development Initiative to encourage this strategy in 2006. Bowers adds that Enterprise is pursuing opportunities with roughly two dozen more churches and is beginning to promote the model beyond the mid-Atlantic region. McIlvaine notes that the “sale and construction process is long and taxing.” Housing project often take between five and seven years to complete. To ease the path, Natanson notes that Nina Janopaul, president of APAH, “has developed a seven-step program” to guide churches through the process. These steps, Natanson explains, include discernment (setting the vision and identifying resources), team building, a feasibility study, construction and, finally, celebration. In giving up their fight to continue to worship in their community’s Catholic church, this small dedicated parish will also give up its formal ties to the Catholic hierarchy, joining other “renegade” groups of Catholic worshipers all around the country.